I am in love with rose gold! 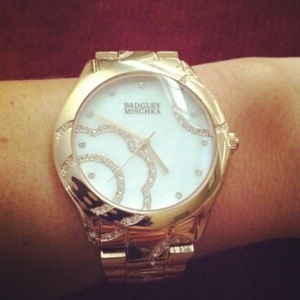 I found this fabulous Badgley Mischka watch at Costco of all places! I love the Swarovski Crystal floral accents, who doesn’t love a little bling!?! I also love the mother-of-pearl numberless face. Rose gold looks amazing on all skin tones and goes with everything. This was a fabulous find for $89. The watch retails for $225 on Amazon. Next time you are at Costco, give their jewelry counter a look, it is worth your time and money. Love this watch! so cute!! especially the Swarovski Crystal design! Isn’t it fun? I love it! yet.. that is on my wishlist. Hubby and I are sanivg to get one for Big Guy to use for Jr. College. Those are beautiful cases, you are right we do need to protect them.. I always worry my keys will scratch the screen of my phone. Thank you for sharing your clumsy moments!